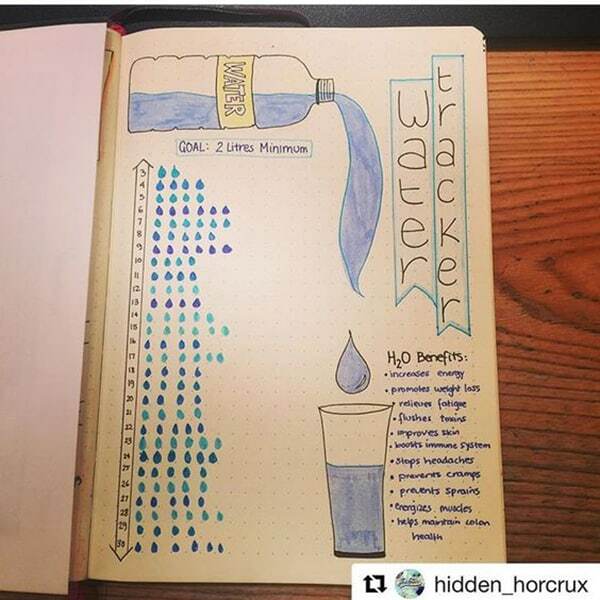 Bullet Journaling can be so much fun! It brings your creative side along with the practical side and creates a book that can help make you more productive and more goal set oriented. I have put together a fun list of journals across the web and the ideas are inspiring to say at least. This is a way to keep your daily planner, tracker, and all the things you want to organize in one book! 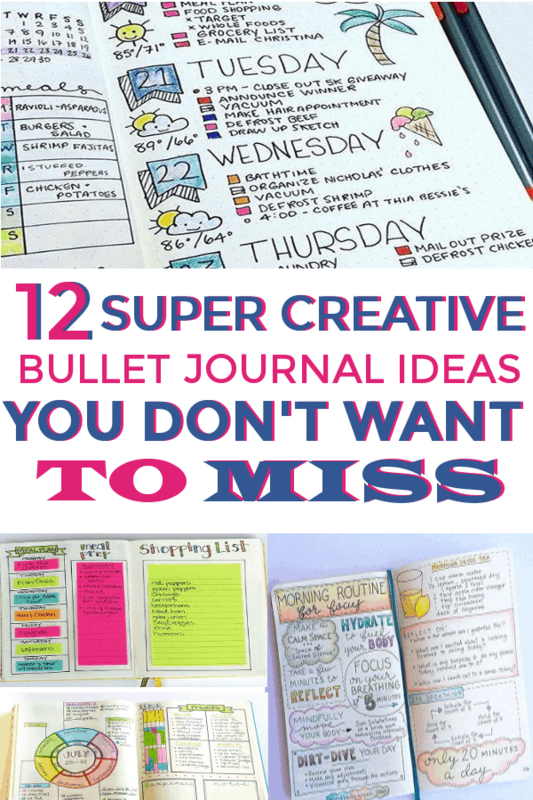 You don’t have to be as creative as some of these, some people bullet journal in a very simple way where it is mostly just their words. 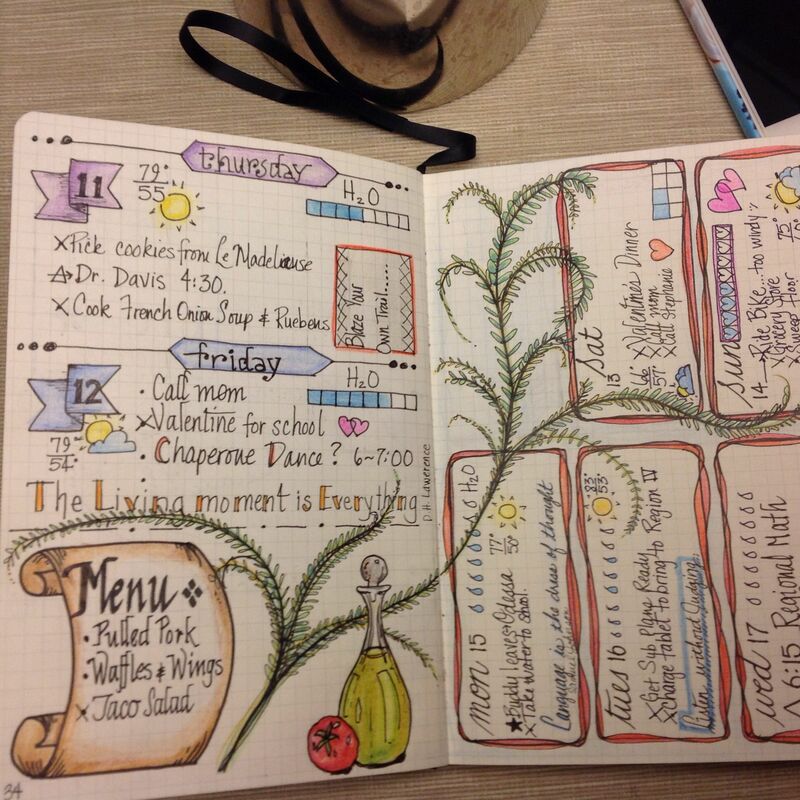 Creating your weekly to-do list will definitely make your week organized. 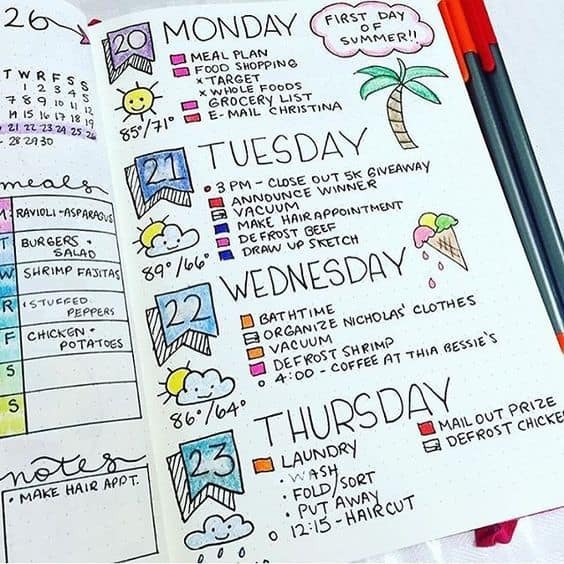 Try out this colorful and fun bullet journal to add fun to your weekly routine. 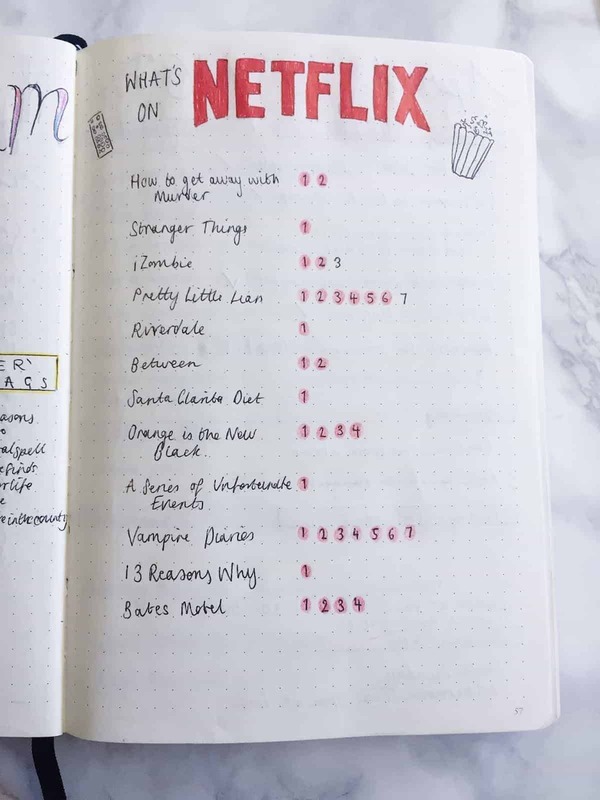 I absolutely love Netflix so to have a journal page of shows I watch or want to watch in the future is genius. I love it! Look how colorful and bright this one is! 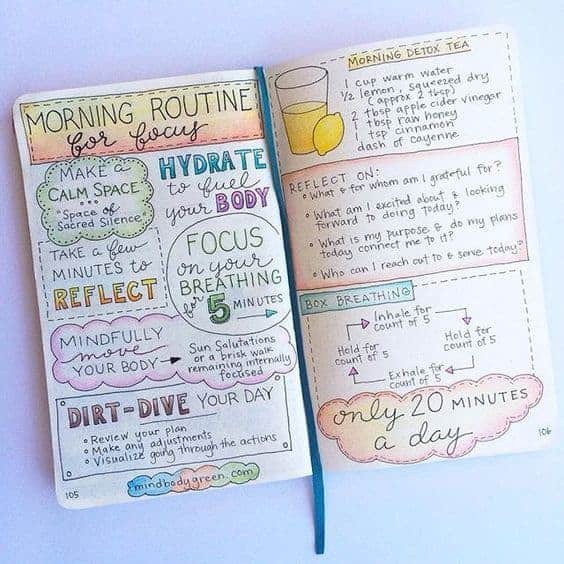 You can put your whole morning routine on two pages. Most of us like to write down some traveling plans down when we are planning a trip. 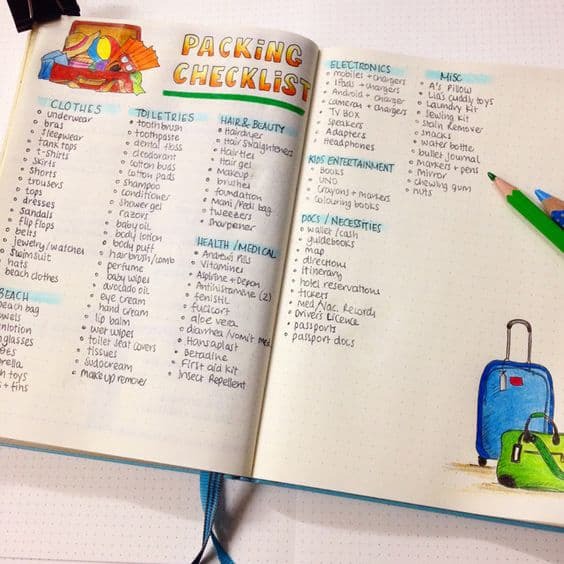 A packing list, places we want to go, and more! 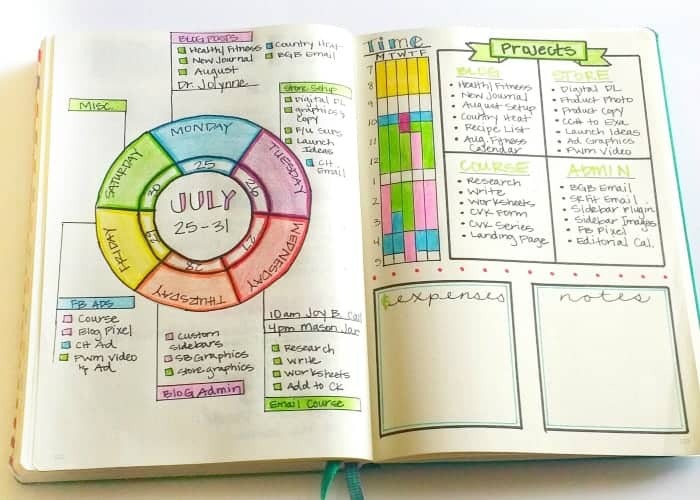 This is perfect for your bullet journaling! Are you keeping track of how much water you drink? This is a great tracker page and will compliment any food plan you are on. If you are like me meal planning can totally get away from me. That is why having my meal plan on paper can help a lot! This page is perfect for that. 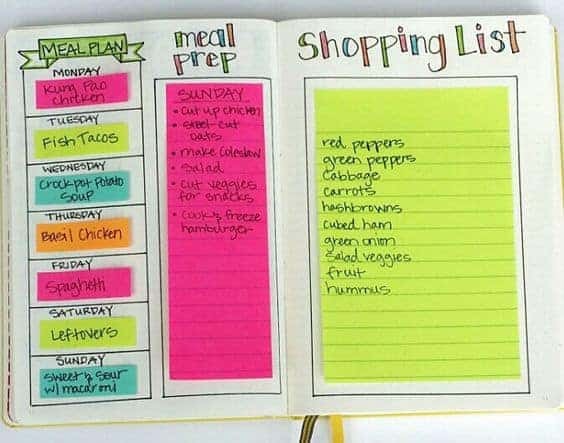 I love how they add the sticky notes for the grocery list. Savings goals are always great goals to have! 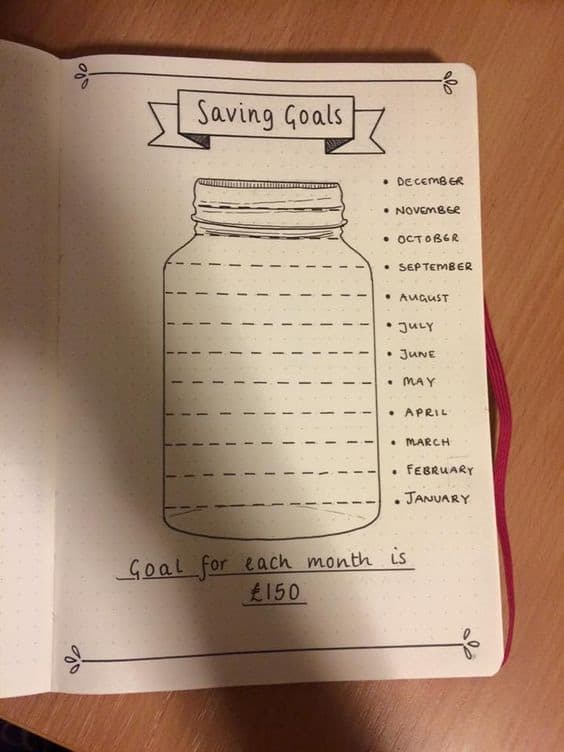 What better way to keep track than a savings tracker? I love the visual of this one! I love this, I think it is just beautiful and it highlights many things about your day on a 2-page spread! 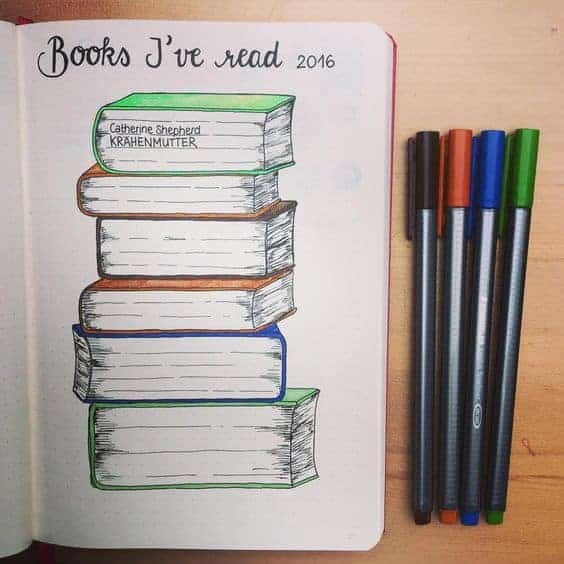 I LOVE to read and I have always wanted to keep a reading journal. This is perfect, I love how the books look and how you can write the names of the book right on the illustration! 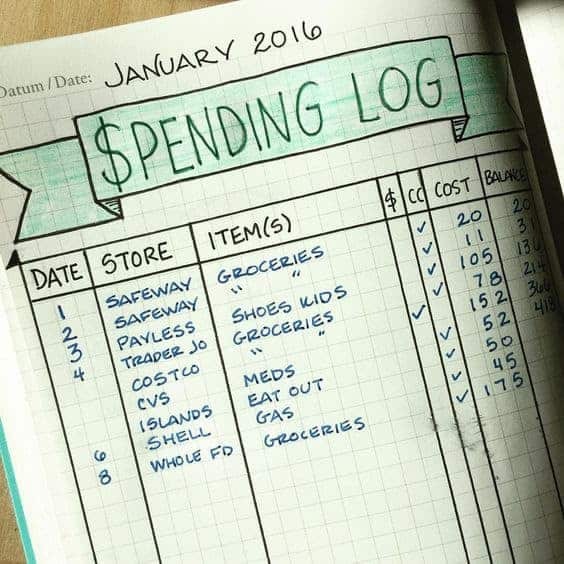 Want to keep track of your spending? 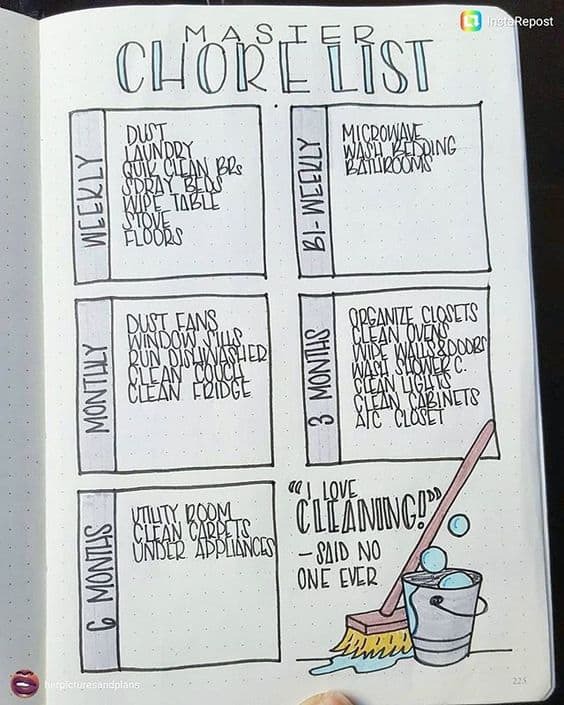 What better way to do it than with a bullet journal page? This is perfect for tracking down exactly what you are spending! What is there not to love about this page? It is colorful, fun, and useful all at the same time! These particular pages are used for blogging but you could apply them to your unique business or home projects! 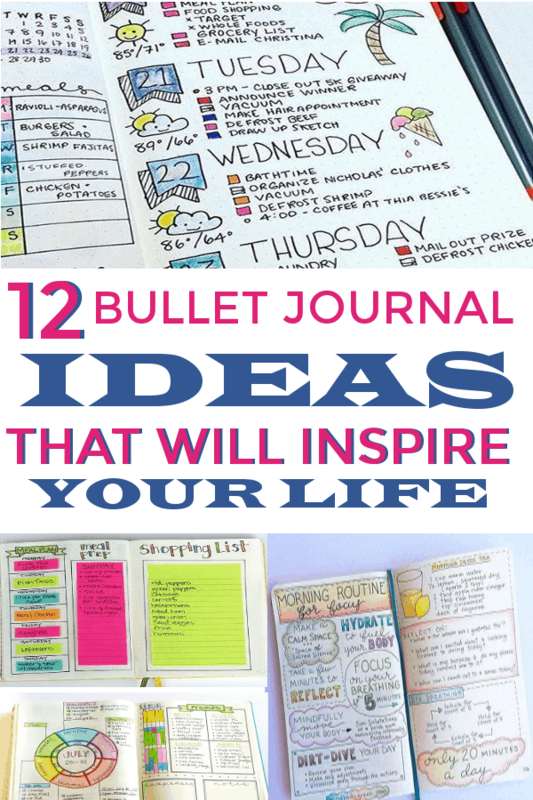 I hope you got a lot of ideas for bullet Journaling. Remember though, just because these are so fancy doesn’t mean you have to be. You can literally just write without the decoration and still have a great journal to keep your life in! WANT TO REMEMBER THIS? 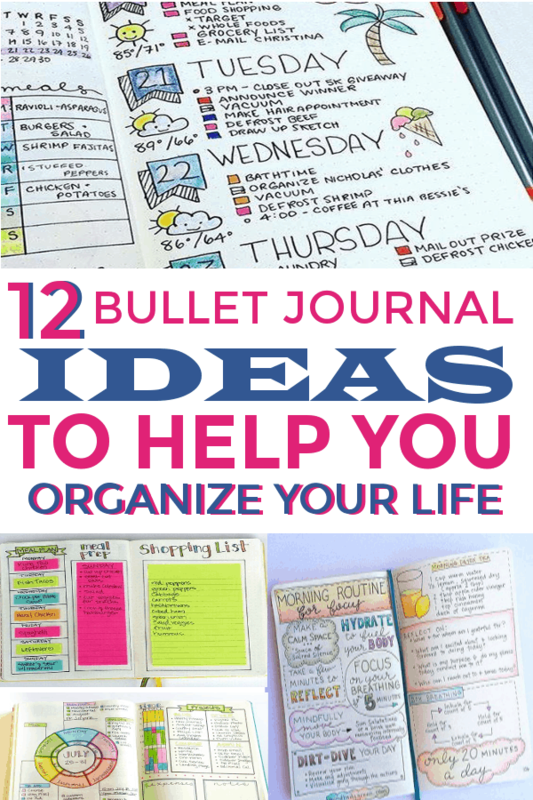 SAVE THE BULLET JOURNALING IDEA LIST TO YOUR BULLET JOURNAL PINTEREST BOARD! 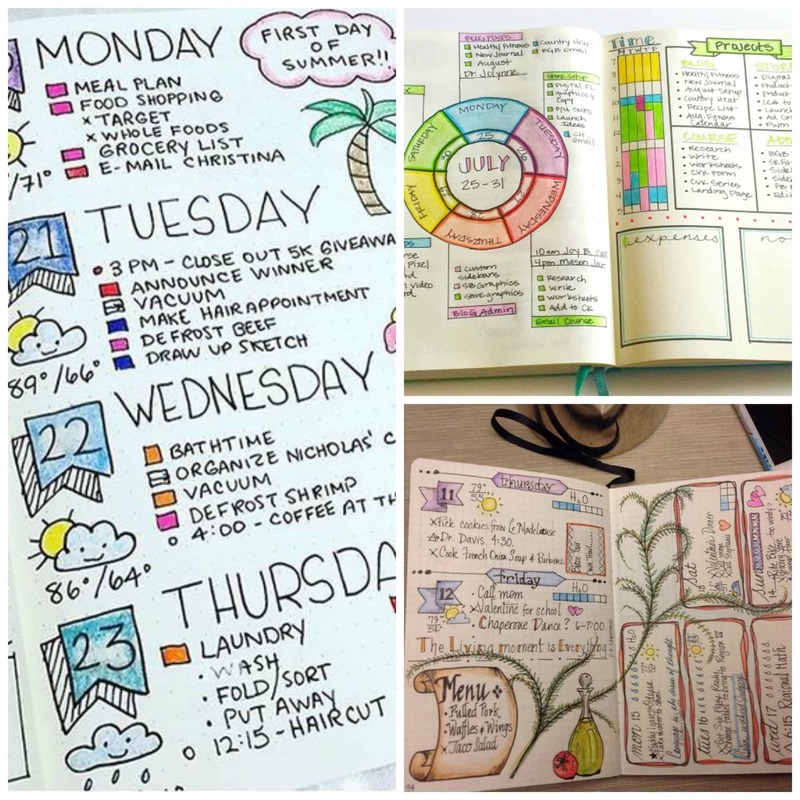 Weekly Bullet Journaling Spreads to Keep Every Week Organized 10 DIY Vision Board Ideas that Will Inspire You to do Great Things ESV Journaling Bible You Can Simplify Your Family Life!